Akata Witch isn’t the “Nigerian Harry Potter.” Here’s why. When I arrived in Lawrence, humbled and honored to be LPL’s new director, the library was in the midst of a building project. I was so excited be a part of this experience. With a new building, we could completely reimagine what a library could be for Lawrence. In my mind, this was a once in a career opportunity to do something meaningful for a city I love so much. When I got my first look at the floor plans, I saw three little rooms on the lower level labeled “Creative Center.” I asked what was going to go there— “Don’t know yet” was the response. It was supposed to be “a place for people to make stuff,” but what was to be made there was not yet determined. I took some time to think about Lawrence and about what might be the best thing to do in that space, and I thought, why not a recording studio? With that notion, SOUND+VISION was born. Several public libraries have makerspaces or media labs with modest audio-visual capabilities, or areas where some small amount of audio-visual editing can happen, but there were few to no full-blown professional recording studios providing access to high-fidelity digital recording to the public—for free! Lawrence, Kansas, seemed like just the right town to try this experiment. In our first year, we saw use of SOUND+VISION flourish. In January 2015, we hired Ed Rose to manage the studio, and he has brought decades of experience that have helped up our game immensely. Plus, he radiates exactly the kind of positive energy a community recording studio needs. We help a lot of beginners, and Ed instills in them the confidence that they can accomplish what they’re setting out to do. We expected to see young rock bands for sure, but use of the studio has been wonderfully diverse. People in our community from practically every age group have recorded everything from country, rock, gospel, hip hop, jazz, spoken word, and pretty much everything in between. People have also used the space to tell stories: an eighty year old woman recorded an interview with her one hundred year old mother about her life. 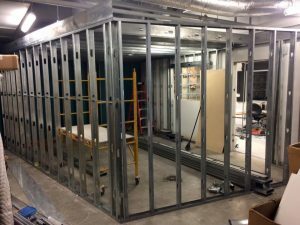 This October, we gave SOUND+VISION a facelift, constructing a new, expanded audio recording space. The recently-finished tracking and recording room does a much better job containing sound, thanks in part to sleek wall paneling and an acoustic treatment. Additionally, we received endorsements from D’Addario guitar strings, Evans drum heads, Presonus software, ProMark drumsticks, Rode microphones and Waves plugins, allowing the studio to offer even more professional-grade tools for its users. We also added a Behringer digital snake that can connect any room of the library directly to the studio. If you saw SOUND+VISION in its previous iteration, you definitely need to return to see the new and improved space. It’s more user friendly and beautiful than ever before. SOUND+VISION is exactly what its name says, our library’s attempt to provide the Lawrence community the opportunity to express themselves through audio and visual means. So far, we’re doing really well with the SOUND part. In 2016, we’ll start expanding the VISION part with access to video creation and editing capacities. Stay tuned. —Brad Allen is the Executive Director of Lawrence Public Library and the former guitarist / bass player of the band Vitreous Humor.